If you’re just about to start your university life, you probably decided to move into a dorm room. Living in dorms is undoubtedly an unforgettable experience, with a focus on social interaction and being independent for the first time. To get the most out of this experience, you’re going to need a killer college dorm essentials checklist. So, why not check out our comprehensive shopping list for students? Whilst studying at the University of Łódź in Poland, I spent 5 years living in dorm rooms. During this time I learned many tricks and hacks about how to get the most out of dorm life, especially what to bring to your dorm room to make the best out of the minimal space you’ll have. This is particularly important when it comes to banned items such as personal ovens, air conditioning units, and even candles. You might have wanted to take these either for convenience or to make your room feel a little more like home, but suddenly find you’re not allowed to. So, let’s go through this big checklist of what to bring and what to prepare you for your big university adventure. Let’s be honest. Settling into a new place may not be an easy thing to do, especially when it’s a new room in a dorm. To make sure you’ll be able to get a proper rest and a good night’s sleep, and be able to fit everything you need or want to bring with you into your new room, you’ll need to organize your bedroom well. Bedding is usually provided by the dorm, but it depends on the place. Regardless, you may want to bring your own bed sheets, pillow, duvet, pillowcases and duvet cover. These can help you feel more at home, or at least more a little comfortable than what the dorm might provide you with. TIP: Add a mattress pad to your bed. It helps just in case the mattress provided is worn-out and uncomfortable. It will also provide more warmth during cold weather. If you’re someone who feels cold easily, you might want to bring an extra blanket. It may be handy when you decide to take a 30-minute nap between your study sessions or if you’re really cold at night. It may also serve as a bedspread, helping to keep your bedding nice and clean. What if you can’t sleep in a dorm room because it’s too noisy or too bright? Use a sleeping mask and earplugs. Foam earplugs are soft and cheap, but wax ones are easy to mold to your ears making them more comfortable to use. Silicone ones also mold to your ears but have the added benefit of being reusable. Both a sleeping mask and earplugs may help you to fall asleep when your roommate(s) decides to stay up late and have the lights still on or create a bit of noise. TIP: Instead of earplugs, you can use its opposite to fall asleep: sound. Calming music may actually help you have better quality sleep and make you feel less tired in the morning. White noise can also have a similar effect. Search Spotify or Youtube for bedtime or white noise playlists. But what if you have problems with waking up? You probably use the alarm clock on your smartphone but it may still be useful to have a physical alarm clock on your nightstand. This can be the classic mechanical clock with bells attached or a digital alarm clock with a built-in radio. But don’t overdo it! You don’t want to become unpopular with your roommate(s) because your alarms create too much noise early in the morning! TIP: To save space on a nightstand, you can get rid of a nightstand lamp and get an LED alarm clock with a built-in bedside light and sunrise imitating light. It can make your mornings more pleasant and provide some light at your bedside without taking up extra space. Your dorm bedroom is not just the place where you sleep. It’s also the room where you keep your belongings. That’s why it’s so important to know some ways to create a well-organized dorm room and make clever use of the limited space. Use plenty of storage boxes, stackable crates, and stackable drawers to maximize space in your dorm room. Get a variety of sizes of these because you can never tell what can and what can’t fit into those little nooks and crannies until you get there. TIP: Stick washi tape or duct tape on the side of your storage boxes, or paint them with chalkboard paint. This enables you to write the names of items on them to find things easier. You can store more items under your bed if you have bed risers. In which case, you may also need a step stool to get into bed. TIP: It’s usually forbidden to put nails or screws into your wall in your dorm room. Instead, use adhesive hooks. They’re easy to put up and won’t leave holes in the wall. However, make sure they’re paint friendly, as any damage to paint may see you charged for repairs at the end of the year. Think twice about taking any expensive watches or jewelry. They may easily be stolen and there may be no chance of getting them back. FBI statistics show that in 2016 there were more than 6,000 burglaries reported on university campuses across the US, which is around 4,000 more compared to 2011. If you share your room but you’re lucky to have enough space between your two areas, you may bring a room divider to provide a little bit of extra privacy. 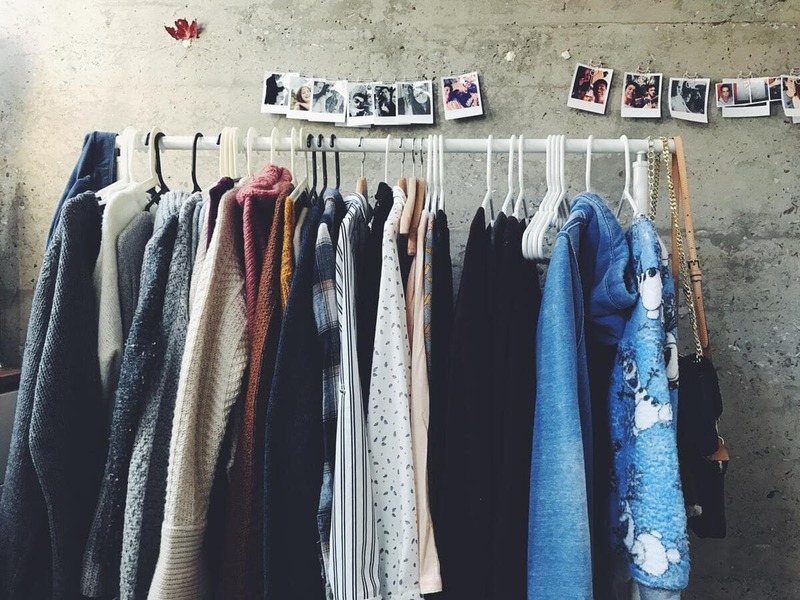 You may think that everything in your wardrobe will be useful for your time at university and you should take them all. Dorm rooms are usually cramped and have little space for storage, which is a key factor that you should consider when packing. You might want to consider only packing for 1 season at a time, rather than all 4. Then, if you’re able to visit family, you can swap 1 season’s clothes for another. You can also do this if family members come to visit you. This is particularly important regarding winter clothes as they take up more space because they’re thicker, warmer, and sturdier. But do plan to have these sooner rather than later. You don’t want to get caught out by sudden changes in the weather! Otherwise, pack only about a week or two’s worth of seasonal clothes, plus only a couple of sets of “going-out” wear. This will save a lot of space compared to bringing your entire wardrobe with you. Not only having these to hand will encourage you to hit the gym and keep healthy (maybe), but they are also quite versatile pieces of clothing that you can wear whether you’re pumping iron or not. A swimsuit can be a substitute for underwear in an emergency. And no-one’s really going to bat an eyelid if you turn up to lectures in sweatpants, a sweater, and sneakers. Chances are, they’ll be dressed similarly too. TIP: Hang scarves, belts, and hats on shower hooks, which can be attached to a clothes hanger inside your wardrobe. This will ensure you keep all of these accessories in one place. Don’t forget about a bag or backpack. You’ll be carrying around lots of notes, books, and maybe even a laptop and some food every day. Bring one that is not only spacious but also comfortable. You don’t want to do your back any damage by using one that’s too heavy and uncomfortable. Living in dorms means you most likely won’t have your own private bathroom area. So, bringing a proper set of toiletries is crucial. But it’s also important to think about how you organize them. 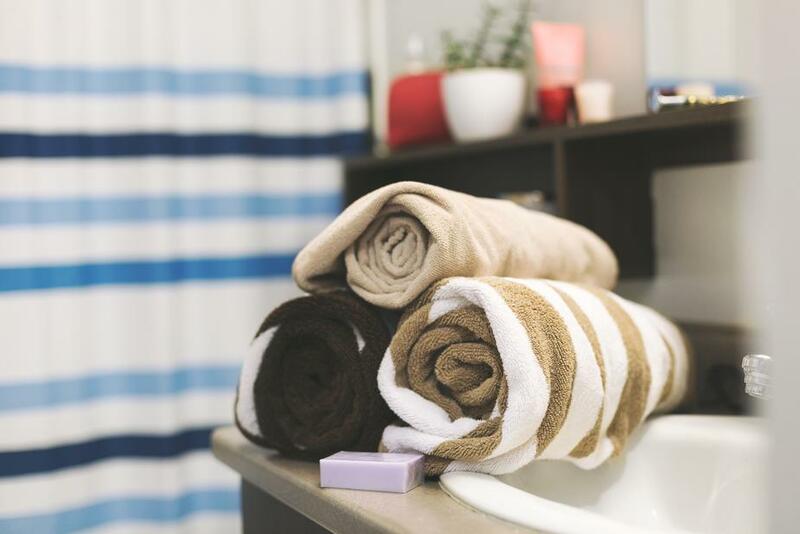 You need flip-flops, a bath towel, a hand towel, a bathrobe, and a shower tote to carry all your toiletries. If you are lucky enough to have your own bathroom in your dorm room, it’s good to have a shower caddy to put all your shower products in one place, and also save precious space. Cotton buds or pads are also useful, especially when removing makeup with makeup cleanser. But you may use cleansing wipes instead. Don’t forget a mirror, especially if you’re going to be spending time shaving or doing your makeup. What else you should take? Even if you decide to lead a wild party life as a student, or do the complete opposite and study all night and day, you’re probably going to have little time for cleaning. Your dorm may have a regular cleaning service. But even then you can’t rely on them to do everything. You’ll still need to do some basic cleaning in between cleaning visits, and at some universities, cleaning staff will refuse to clean your dorm room or common areas if they are too dirty and untidy. You’ll also want extra garbage bags and perhaps an extra waste paper basket for your room. TIP: Whilst you can buy garbage bags for small bins and waste paper baskets, it’s cheaper to reuse plastic shopping bags as bin liners. The handles also make them easier to tie up. TIP: You might want to consider laundry detergent capsules rather than powder or liquid. Using these mean you want have to measure out your detergent which can be tricky and messy. You might also want to use capsules that are a combination of both detergent and fabric softener. However, whilst these are more convenient, they’re also more expensive. TIP: Make it easier to carry your laundry to a laundry room and choose a laundry hamper on wheels. Alternatively, you can use a backpack. Depending on how far away the laundry room is, carrying a basket might not be as easy or as comfortable as you think! You shouldn’t need to bring an iron and an ironing board as it’s possible that your dorm room will supply these. However, these are unlikely going to going to be top of the range. So, it’s up to you whether what’s supplied will suffice or if you really want to have your clothes crisply ironed. If the latter is the case, you might want to consider a mini steam iron and a tabletop ironing board as these will save a lot of space in your room compared to their full-sized counterparts. Lastly, if you’re unable to use or there are no dryers in the laundry room, get a clothes horse to dry your clothes on. This will save you hanging your wet clothes over every conceivable piece of furniture in your room! Not every dorm has separate kitchens for each room. Some of them have one communal kitchen for everyone in your dorm apartment or on your floor. Even then, some universities will not provide anything other than some small appliances such as a refrigerator and a microwave. You might not be able to add your own extra appliances either. First of all, focus on what you’re actually allowed to have. Firstly, you’re going to want a plate and a bowl to eat from, as well as some cutlery. You only need to bring one set just for you to save on space. Also bring some plastic or glass containers to help store and stack your food in the fridge to save space. You might also want to bring a fridge thermometer too, to check that your refrigerator is operating at a safe temperature (4c/40f). Remember that any food containers, plates and bowls you use should be suitable for using in a microwave. If you are allowed to bring other small appliances to your kitchen, use this opportunity to take a mini oven and a toaster. Safety is absolutely vital so remember to always check whether you unplugged your cooking devices after you’ve used them. 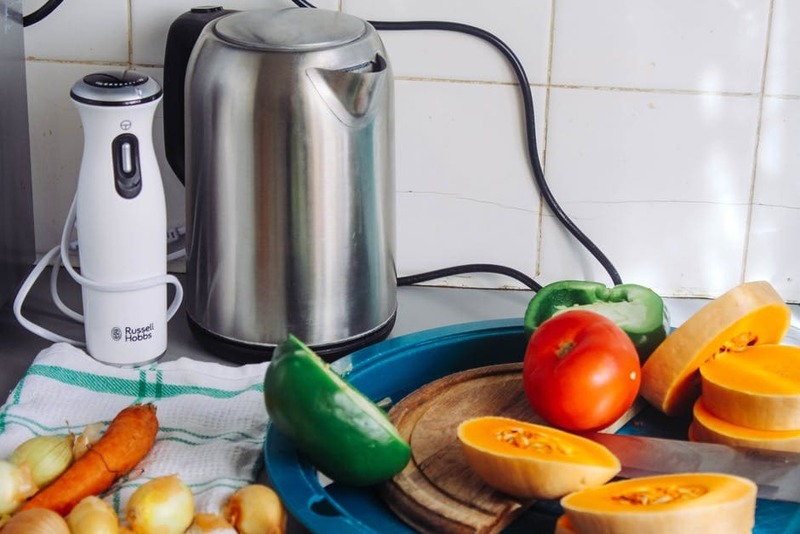 If you’re bringing an electric kettle, think about a stainless steel one for less stains, and one with a 360 degree power based for easier use. With a kettle you’ll be able to make some coffee, oatmeal, or instant noodles. It’s good to have water filter too. Why? Some tap water might not be suitable for drinking and buying bottled water can be cumbersome and expensive. But remember you will have to buy extra filters if you are using one. Don’t bring lots of cups, mugs and glasses. Like your plates and cutlery, one of each is enough. If you have access to a communal stove or you are allowed to bring your own portable one, make sure you have a regular frying pan and two small pans. These alone will be enough for cooking, so don’t bring anything else as there’ll be too little space to store them in. But what you’ll also need are utensils: remember to take plastic or wooden ones, which won’t damage the surface of your frying pan. What about preparing your food? To be extra safe, make sure you have safety covers for them. Also, you may want to take a knife sharpener as some cheap knife sets can become dull quite quickly. What do university students eat? That’s probably one of the most frequent questions that you or your parents will ask. The answer is: it’s highly dependable. There’s no need to drastically change your eating habits when studying at university. You may have a meal plan, or even plan to eat out more often than not. But the most cost effective way to feed yourself is to cook in your dorm. Pasta – spaghetti, penne, farfalle, pappardelle; white/whole wheat/vegan. There’s plenty to choose from but choose the ones you actually eat the most often. Also, think about getting whole wheat pasta as it’s much healthier for you. Grains – rice, whole oats, quinoa, bulgur, couscous or any other that you like. These are easy to cook, will keep you full for many hours, and are very nutritious. TIP: Eat nuts on regular basis. They have a great impact on memory and learning, which is what a student needs. They don’t require any equipment and you can make or buy them easily. What every university student should have on hand are healthy snacks. Fresh fruit, oatmeal, hummus with carrots and celery, granola bars, yogurt, smoothies, rice cakes with avocado and trail mix are excellent examples of healthy and quick to make snacks. These are great on daily basis as they contain many nutritious values, vitamins and minerals. TIP: Keep your snacks in one place in a hanging shoe rack that goes on the back of your door. This will give you easy access to snacks in case you’re in a hurry and you need to take some with you. One of the most important spaces in your dorm room is your study area. How you decide what’s on and around your desk may influence your learning process so it’s best to organize it well. So, what do you need on your dorm shopping list to help you get the most out of studying? Sometimes you may stay up late and study all night and it’s important not to strain your eyes, or at least as little as possible. Therefore proper lighting is vital. Either get a standard desk lamp, a clip desk lamp, or an LED lamp. Do some research on what lamp is best for you, taking into account things such as: adjustable brightness and colour temperature, distribution of light, and impact on the environment. It might be a good idea to check whether you need additional light bulbs and extension cords, too. Another item which might improve your comfort while studying in a dorm room is a desk chair. Although a chair is usually provided, you can bring your own, more comfortable one. But be aware that if you do, you might need to find somewhere to put the spare chair! Use folders and binders to help arrange your study materials. This will keep all your notes in one place. A stapler, staples and staple remover will help you even more with doing that. Also, if you have stackable drawers or magazine files you can store notebooks, note paper, and textbooks neatly too. TIP: Another way to store your notebooks and books is to put them in a storage cart. These are shelves on wheels so they will be easy to take out from wherever you’ve chosen to put them. TIP: Use empty jars or cans to create a pen and pencil station on your desk. Glue them together, decorate them with ribbon, or paint them with spray paint to make them fit your style. TIP: Use binder clips to keep your cords in order. Clip them on the edge of the desk and thread the cords through them. Other way for organizing cords is to create a charging station out of an old shoe box. Thread the cords through holes in the box and hide all the chargers inside. TIP: Instead of plastic boxes or containers, you may also use a tackle box. It has small compartments which will keep your accessories well organized. 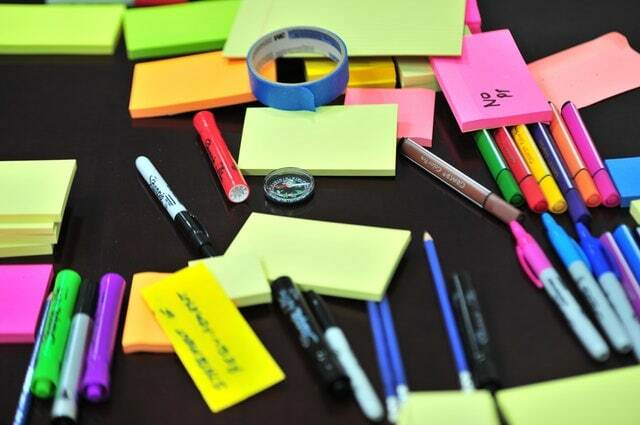 TIP: Change the colour of boxes, containers and other accessories such as stapler using spray paint. It’s easy to do and saves a lot of time and money if you can’t find the ones which match your desk design. Other items for your study area might be a calendar and a fan. A calendar on or near your desk enables you to keep track of all you deadlines, exam dates, and important events. As it’s on your desk you’ll always see it, meaning those crucial dates won’t slip your mind. Air conditioning units are typically banned in dorms, so take a fan instead. It’s better than nothing! Your university or student union might even have their own app! There are plenty of other ways you can use your smartphone to make studying more convenient, so don’t limit yourself to the more common uses: be creative! As for what type of computer you should bring: a laptop is the best. Desktop computers are useful for students whose studies require more powerful devices, such as those studying graphic design or music technology. But it’s not portable. If you decide to use a desktop computer, you’ll need to take all the peripherals, such as a monitor, a keyboard, a mouse, headphones or speakers and all cables that go with these. Tablets are portable, being small in size and light, but they’re usually far less powerful than a desktop computer or a laptop. A laptop is a great compromise on both power and portability. That’s why a small, light laptop is probably the best option for your learning and creating projects, or for simply surfing the internet and using social media. If you prefer laptop or tablet, don’t forget about the charger. 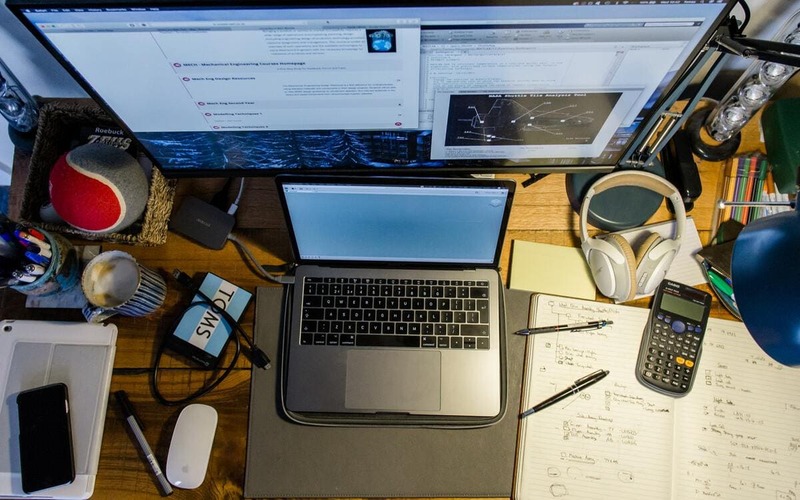 TIP: To save space on your desk, put a monitor on a box or a low shelf. This way, you’ll be able to store accessories or notebooks underneath it. TIP: Invest in a lap desk. It’s safer and more comfortable than putting your laptop on a pillow or your bed. As for a USB drive, having one is very handy. Whilst you’ll mostly be saving your files to the university’s cloud or network, backing up and using a USB drive makes them more portable and accessible. However, I strongly suggest you don’t keep all your work only on a USB: use it as a backup or to simply transport your files from place to place. If you lose or damage your USB drive, you don’t want to lose all of your notes and work! TIP: During the first few weeks of university, many companies will be giving away free stuff to new students. It’s highly likely you’ll end up with a free USB drive, or even several! However, these might not be as secure, spacious, or as reliable as buying your own. You don’t necessarily need to bring a printer. There will be lots of printing spots at your university. But, if you’d rather have your own printer, remember about ink and paper. This will certainly be useful if something does go wrong with the university printers. Being a student is difficult and studying is tiring and that’s why study breaks are important. If you have enough space in your dorm, you might consider taking a TV, DVD player, stereo or video games console. They’re also good options for inviting people to your dorm room to socialize. Starting university means a lot of changes, including learning to be independent. Part of being independent is being able to look after you important documents and making sure they’re kept safe. So what are these documents you need to have? You’ll most likely keep your ID and student ID in your wallet, along with your debit/prepaid card and social security card. But if you’re going on holiday, take only what you need. Do you really need to take your student ID with you down Las Ramblas in Barcelona? Because if it gets stolen along with your wallet, you’re going to have to pay to replace it when you could have just left it secure in your dorm room. If you have a car and you take it to university, you’ll also need driving license and car registration, and motor insurance documents. 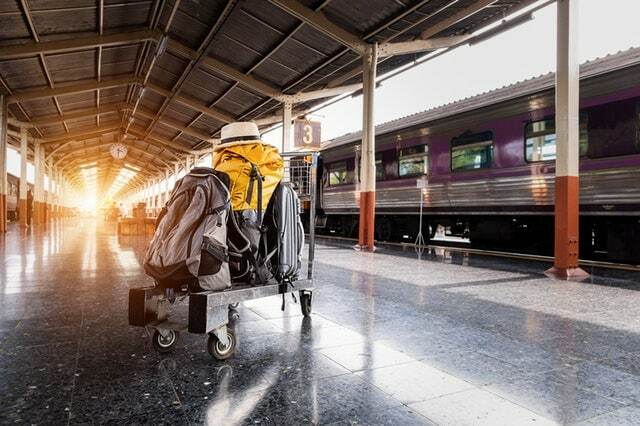 Depending on what country you’re studying in, you may also need to being your medical insurance card to be able to go to the doctor that is closest to your dorm. Keep your bank account information, financial aid forms and renters’ insurance in one folder, so you don’t lose them or throw them away accidentally. These are other items you should have on your college checklist that may well come in handy. Think about having a flashlight and a powerbank just in case electricity cuts out without warning. Duct tape, safety pins, and a sewing kit can help you repair or patch up various broken objects so you can use them for longer. 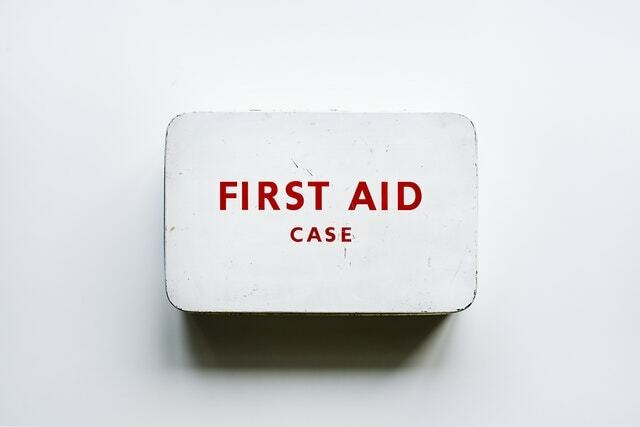 A first aid kit will be great for dealing with any minor injuries. It may be also a good idea to have some spare batteries and light bulbs in your room just in case you suddenly need to replace either. A weekend bag/suitcase, umbrella and sunglasses – these you can’t forget if you want to travel or just come back home for the weekend. Speaking of weekends, take a board game or two. It’s good for socializing and having fun without technology or alcohol. The dorm shopping list we’ve given you might seem pretty long, but don’t think you have to bring everything on them. They’re there to give you an idea of how to prepare yourself for one of the biggest changes and challenges you’re going to face. Therefore, edit them to fit your needs, budget, and travel situation. It’s also a good idea not to take all of the items on the list right away and see what you might be able to share with your new roommate(s).